The design and construction of contemporary public structures tend to be governed by two fundamental factors: practicality and cost. This has often led to the creation of structures that are, in the eyes of some observers, less than inspiring. However, in older cities such as Cleveland Heights, this was not always the case. Consider, for instance, two of the city's fire stations: Noble/Monticello and Lee/Silsby. Although these facilities were designed to suit the basic needs of the fire companies they housed, they were also intended to be "an ornament to the neighborhood in an architectural sense." This was at the insistence of the legendary mayor Frank Cain, who was committed to the idea that architectural quality need not be sacrificed on the altar of functionality. City leaders further expected that the stations would serve as an architectural standard for future development of their respective areas, particularly with respect to commercial properties. Fire Station Number Two, at 2529 Noble Road just north of the intersection of Noble Road and Monticello Boulevard, was built in 1929. This was the first of Cleveland Heights' outlying fire stations to be constructed as a result of the city's rapid expansion and population growth in the 1910s and 1920s. 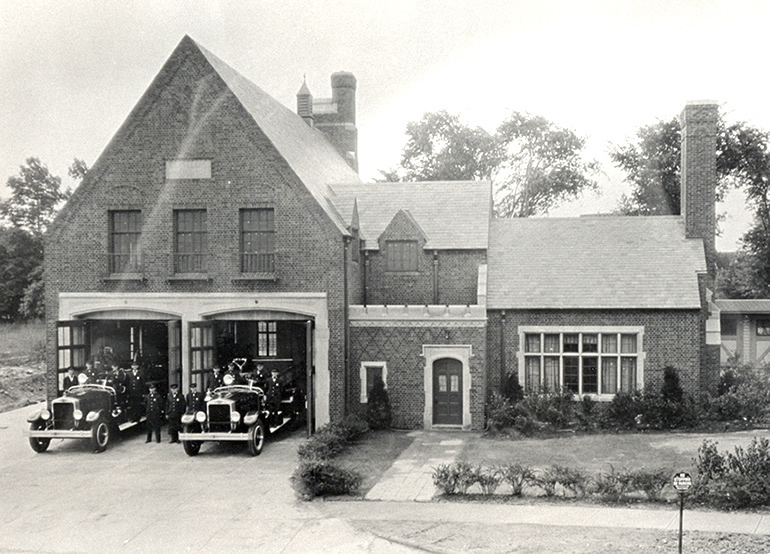 Prior to this point, the city's original fire station (Number One), which was located at the old city hall on Mayfield Road, had provided fire protection for the entire city. The new station would enable a more rapid response for residents of the increasingly densely populated northeastern section of the city. The station was designed by the de facto city architect and native Ohioan, William Powell, a graduate of Oberlin, the Case School of Applied Sciences and Columbia University. Powell also attended the Ecole des Beaux Arts in Paris. Prior to architecting the city's new fire stations, Powell had designed the old city hall and Cumberland Pool. In keeping with his other public facilities, Powell drew up plans for the fire station in the English Tudor Revival style, which he knew would please Mayor Cain. Its outstanding exterior features included steeply pitched slate roofs with copper ridging, tapestry brickwork, and chimneys corbelled with limestone trim. The entryways, some windows, and the apparatus doors were also trimmed in limestone. All of the building's windows were outfitted with English casement cottage sashes. Inside, the first floor consisted of a large equipment room lined with white enamel brick and a concrete floor. Near the main entrance of the building was the signal alcove. Adjacent to the equipment room was the firemen's recreation room, complete with a magnificent stone fireplace and bookshelves. Just off the recreation room there was a spacious living quarter for the officer in charge of the facility. Completing the main floor were a kitchen and dining room for the firemen, and a small repair garage for servicing the fire equipment. The second floor consisted of a dormitory that could accommodate eighteen people, as well as lockers for their belongings, showers and toilet facilities. And yes, the firemen used sliding poles situated at either end of the dormitory to pass quickly from the second to the first floor. With the exception of the enameled brick in the equipment room, all of the walls and ceilings on the first and second floor were finished in Old English rough plaster. As one contemporary observed, the living quarters reminded one of nothing so much as "a high grade club." The station also had a basement that was outfitted with a small gymnasium and showers, as well as a storage room to house the chemicals and other materials used to fight fires. One of the most unique design features of the building was a fifty foot hose tower that was connected to a drying apparatus. This would allow hoses up to fifty feet long to be hung up to dry, which was a more efficient means of drying them and subjected them to less bending and coiling, which typically caused the material in the hoses to deteriorate more rapidly. Powell's hunch that Mayor Cain would like the design was correct. 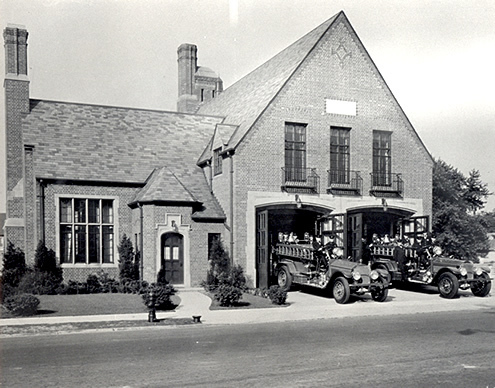 When Fire Station Number Two was dedicated in March 1929, Cain stated, "The old idea that a fire station must be an ugly, cheese-box type of building is now out of date. It was never in date as far as Cleveland Heights is concerned. Those who think a fire station cannot be as artistic and pleasing a structure as any it is possible to build should go and take a look at the new Noble Road station." 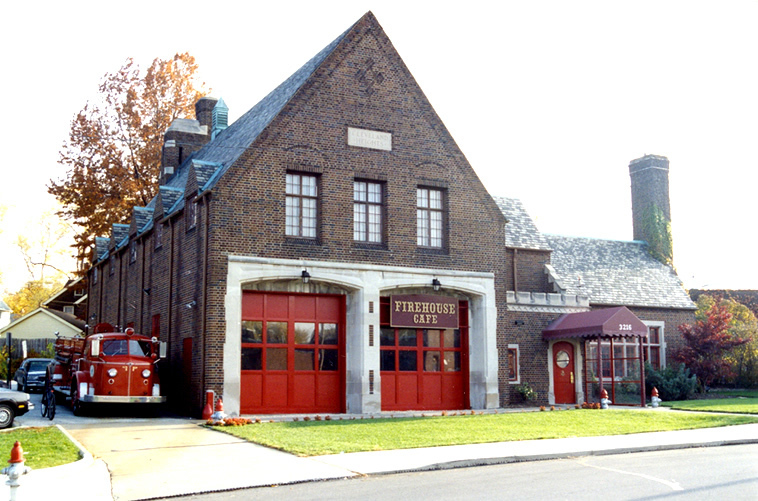 The Cleveland Heights Press echoed the mayor's sentiments, noting that the new station had been heralded as "the most beautiful fire house in Greater Cleveland." The total cost of the structure was $55,000, much of which was funded by the sale of an adjacent parcel of land. As this section of the city was developing rapidly, officials felt certain they recoup all of the building costs within several years of the station's completion. As construction of Fire Station Number Two neared completion in late 1928, City Manager Howard Canfield proposed to Mayor Cain and the City Council that a third station be constructed near the intersection of Silsby and Lee Roads to service another area of the Heights that was undergoing rapid development. Canfield suggested that Powell again be commissioned to design the station in a style identical to that of Station Number Two. In 1931, Station Number Three--the Silsby-Lee facility--was completed. As many readers know, it's a mirror image of the Noble Road structure, albeit with slight modifications to accommodate the different shape of the Silsby Road land parcel. Stations Two and Three served Cleveland Heights residents for half a century until more modern facilities were constructed in the 1970s and 1980s. Both stations were closed in 1982. Station Number Two subsequently re-opened in 1990 as a police academy, which it remains today. Station Number Three housed a series of restaurants. Since the late 1990s, it has been the site of the Lee-Silsby Compounding Pharmacy. Despite these changes in the utilization of the inside of the buildings, their handsome, eye-catching exteriors remain a testimony to the architectural standards set by Cleveland Heights' early leaders.